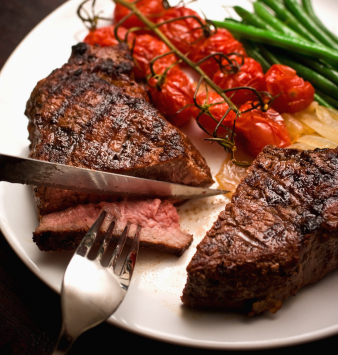 Is eating healthy grass fed meats part of your goals for the New Year? Topline Foods can help with that! We offer easy online shopping for organic grass fed meats including beef, chicken, wild caught seafood and more delivered to your door. Shipping in the metro Phoenix area is free for orders over $199 and you can choose to pick up for free for orders over $99. UPS rates for shipping in Arizona are very reasonable and only 1 day in transit. Why is eating organic grass fed meat so important for your healthy New Year? Organic meat excludes the use of GMOs, herbicides, pesticides, antibiotics and added hormones. And, grass is the natural diet of cattle which makes them healthier and their meat is more healthful as well. Grass fed animals are higher in many heart healthy nutrients while also being lower in unhealthful Omega6s (and other compounds) than corn or grain fed animals. You can learn more about grass fed meat here. Where in Phoenix can you find grass fed meat? Topline Foods (Phoenix, AZ) makes it easy to find grass fed meat. Just shop online and we’ll deliver to your door. No more running around town to farmer’s markets or organic grocers only to be disappointed in the selection and quality. We offer a full line of grass fed meat including Filet Mignon, New York Strips, Rib Eyes, Top Sirloins, Roasts, ground beef and burger patties, just to name a few. If you are looking for organic free range chicken we have that, too! Also, wild caught seafood and more. Save time and shop online for all your healthy grass fed meat in the New Year. This entry was written by Jeff, posted on December 23, 2013 at 6:53 pm, filed under Announcements - Cities, Blog and tagged Arizona, AZ, beef, grass fed, healthy, meat, New Year, organic, Phoenix. Bookmark the permalink. Follow any comments here with the RSS feed for this post. Both comments and trackbacks are currently closed.